The Bike Show has previously been held in London, but for 2011 moved to the NEC, so worth a visit to see where the future lies for we cyclists. 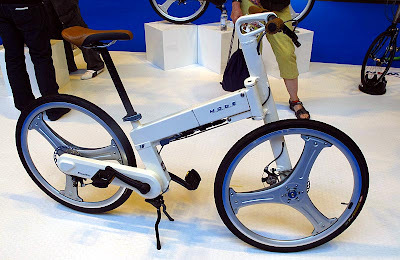 Most of the big names were in attendance but not, surprisingly, Brompton, Cateye, Birdy or Dahon. 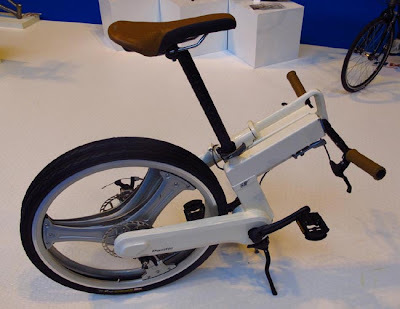 Lots of inovative designs, many using materials other than the traditional steel and aluminium, and some clever design ideas, particularly in folding bikes. The frame is aluminium and it folds very neatly such that it can be trundled along in the folded state. It’s weight is 12kg, so no lightweight, but since the machine can be trundled, weight is less important. Only for loading into vehicles would it be necessary to lift it. Not cheap at £1600, but mass production would no doubt bring the price down significantly. The new Derby Inner Ring Road (Connecting Derby) is proving to be advantageous to cyclists giving us more options for safe cycling in the City, with generously proportioned cycle paths alongside the highway. Close liaison between Derby Cycling Group and the City Council was an important factor in the planning of these facilities. Most junctions have Toucan crossings and there are some traffic lights which are triggered by a bike on it’s approach. You may have to wait a minute or two, but you will get a green light to proceed whilst other traffic is held at red. Try the one in the bus lane approaching Curzon Street from Uttoxeter Road. Also a new webcam has been set up in Celtic House high above Stafford Street and this is useful to check the traffic situation before you venture out on your bike. It faces West looking towards Mickleover on the horizon and you can see the new roundabout at the Uttoxeter Road/ Stafford Street/ Curzon Street/ Mercian Way junction. The webcam has been kindly provided by the Smith Partnership who have offices in Celtic House. 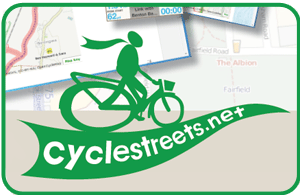 Let us know if you are aware of any other webcams which are of interest to cyclists in Derby. Minutes were read and agreed. Agenda is being sent out by the Chair of the next meeting. +MA to ring them up to find out what progress has occurred. Council are going audit the new design for the station forecourt. Money runs out at end of March. New multi storey car park near to station. Derby City Council has published its consultation document for its next three years’ spending. It is available here. Now is the time to respond to what it says – or what appears to be missing. This is the time in the budget-setting process when people are most able to alter what will happen, so although it doesn’t seem exciting, please help to make a difference. The part of the budget that deals with highways and transport issues is “Neighbourhoods” starting on page 51, but it is helpful to read the ‘Introduction’ as well. This mentions in section 6 the Council Plan. Referencing one or more of its aims in your response to the Council may give your comments more weight – and the council officers and councillors more pause for thought. Of particular relevance to cycling might be “A thriving sustainable economy”and “Good health and well-being”. The budget (see the table on page 56) includes a cut of over £500,000 from the highways maintenance budget and a promise to replace £500,000 of this from the highways capital budget (see not on page 60). This will mean that there is less money for small scale improvement schemes. You may also be concerned about the further cut of £50,000 to the Climate Change Unit (page 58) which had in the past been able to run events like Ecofest and has done a lot of work to cut the Council’s fuel bills, including by pushing for a council travel plan. Of course it’s fine saying ‘don’t cut this’, but the budget does need to balance. Where might extra money be found, or other savings made? They proudly state that street lights won’t be switched off (which some other councils are now doing during the early hours), but should this be reviewed? They don’t intend increasing Council Tax, is this the right decision. The online consultation form is here, but you can also write or email to your local councillors directly, which will carry more weight (as not many people do this!). If you do, it would be wise also to copy in the Strategic Director of Resources, Roger Kershaw. The latest DCG newsletter can be downloaded from September 2011 newsletter link.